So after a long break from the game, I'm playing Career Mode for the first time (on v1.0.5). There's a massive (and still growing) space station around Ike, due to various inscrutable contracts. There was a manned mission to Ike, and three successive rescue missions have gotten them at least to high orbit though not quite to the station yet. Currently probes are being launched to all remaining major objects in the system. We should get getting good science soon, all except for Dres which is confounding attempts at getting an encounter. Jeb was calmly hanging out in a "stable" parking orbit near Duna (though out of fuel) until he got too close to Ike and got ejected into interplanetary space. We're sort of at a science bottleneck until the probes get in. I guess we could start exhaustively science-mining Minmus instead. Well, the Ike space station addition lacked sufficient deltaV, trying to use the lander to enter orbit ended up blowing all the RCS and solar panels off, and the ship finally ended up in an orbit inclined 90 degrees to Duna. So we're going to mark that as a "partial success". In the meantime we went to a Canadian LOTR cosplay convention and hired Kerbalnauts Merrey and Luny. Their only goal was to get some "quick" funds/science by planting a flag on the Mun. They ended up landing sideways on a crater rim and rolling a very long way to the bottom (but from the looks on their faces they were having a great time). The Jool probes were more successful, now have a small probe in orbit of all the smaller moons in the Joolvian system. We forgot to include batteries on them though so trying to return science is a very slow process. While waiting for the Eelo and Dres probes to get anywhere we've designed a Duna super-booster with excessive delta-V and we've sent Merrey out to see if he can clean up the giant mess on Ike, though I suspect he might just make it worse. After two years travel time Merrey's recuse finally made it! A lot happened in the interim. We sent a scientist and some more rooms for a base expansion contract, but forgot to include the auxiliary lab. This involved a lot of dangerous sliding around the surface of Minmus under thrust, would have been useful to have ski-landing parts. Two failed Moho missions, mostly due to serious lack of Delta-V. A third one is now on the way that hopefully will fare better. We're Moho bound! From Kerbin it's up but to Moho we go down! As said, Merrey did arrive at Ike and docked with the castaways. We'll see if we can get them to IkeStationZebra without incident. Robert, captain of the first ill-fated first Moho mission, made a dramatic re-entry over Kerbin at 5000m/s with a perapsis of only 10,000m. Most of his ship exploded (it took KSP over a minute to process 5s of explosions) but he landed successfully after some last-minute panic when the corner of the parachutes were stuck inside the cargo bay and had to be manually deployed. Desktop, captain of the second ill-fated Moho mission, is possibly now on a collision course with Eve. A rescue planned mission was sent to get Jeb from his 5-year deep-space expedition. Our Eelo probe arrived, but it's going to take it 200 days to get to perapsis. More adventure is in store, although a Jool launch window opens in 10 days so maybe that will take precedence. Good news! After three tries we finally successfully made a Moho landing! Not coming back any time soon though unfortunately. Desktop Kerman, who had been on the aborted previous Moho landing, re-routed his ship so he could be the first Kerbal on Eve. That went surprisingly well (for him anyway) but due to some lack of planning his capsule didn't have a transmitter so none of that glorious Eve science made its way back to headquarters. The Eelo probe finally made it to perapsis. Recently returned Robert was quickly debriefed and has been launched on a mission to the Joolvian system. The launchpad has started exploding on every launch for some reason, even though I don't think the ships I am launching are significantly different than previous ones. The little ones in the family wanted to make a "Kermal" spaceplane. It only occurred to me later that I should probably switch to a sandbox save before attempting this. Brilliant :). Congrats on landing on Eve and Moho, too! 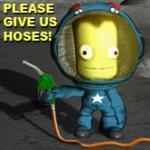 You look to be greatly in need of a wonderful little bit of instrumentation called Kerbal Alarm Clock. Keeps track of all you stuff. Don't fly more than 1 mission at a time without it. Don't we all like Ike? Just ask Mike, he won't dislike! Yes, I should probably look into kerbal alarm clock. I tend to like playing things as stock as possible. I had a little bit of time to play again and I thought I'd try to sort out the mess around Ike/Duna. The rescue craft was docked in low Ike orbit, attached to a ship that held the 3 Kerbals from multiple previous rescue attempts. We managed to get them from a low polar orbit to IkeStationZebra which was in a high-equatorial orbit! Switch to the expansion ship... only to find Detrix and Bill had been flung out of their parking orbit by Ike at some point and were now orbiting the sun. Great. We wanted to grab the plant-a-flag on Duna contract, so Merrie was sent down and he managed a nice landing. So once again Ike is the source of many problems, and IkeStationZebra is quite crowded with 6 kerbals now. Finally time to clear out some contracts. We have a Mun orbit rescue (not one of mine for once) and maybe we can get that missing science lab to Minmus Base at the same time. Launch went OK, very wobbly. Having a load-bearing probe core didn't help. The Munar rescue of Herely wasn't too bad, although of *course* he was in a retrograde orbit which I found out after I was already prograde. He and Daphty landed at Kerbin's North Pole, which had surprisingly little science. The probe took the science lab on to Minmus. This was hard as I forgot to put any SAS or RCS on the stage. Landing went OK, I learned my lesson and put landing gear on *all six sides* that way it's not possible to land upside down. And wheels are much better than sliding. Now docking, that was a pain last time, and we don't have any extra docking ports, so *dual claws* and *ramming speed* it is! Here's that science lab you were asking for, and we're delivering it in the most alarming way we can think of! I'm glad others are enjoying this story too. So year 13 is ending on many annoying notes. We launched a rescue craft to Valentina's crew around Eve, with a rover we plan to airdrop to Desktop on the surface. However partway there we realize we forgot any sort of heatshield for the rover. Our first mission, a combined satellite launch/mun-orbit-rescue went poorly. After we got to the crazy -140 degree inclination for the satellite it turned out the separator was missing and we couldn't get the contract because we weren't unmanned. I later realized I could have just done an EVA for 10 seconds and we would have been good. To try to salvage the mission we went and ore mapped the Mun, which was interesting I guess. Not enough DeltaV to rescue anyone, so back to Kerbin where we somehow managed to land with a huge scanner still attached. We re-tried this launch, this time launching retrograde directly. But we started the gravity turn too early and solid rocket separation knocked off part of our engine stack. We recovered and still made orbit though. Satellite launch went OK, and we did rescue Kacy Kerman from orbit this time. Next on the list was a Pol flyby. We went to Jool space to look for our Jool orbiter, to find that the Kraken had eaten it at some point without notice. Weird. Instead we tried yet another ill-advised Minmus expansion, but we forgot to add critical probe cores to various parts so that was a big waste of time/money. The Eve rescue did happen! In theory Valentina and crew are on their way home! The Jeb rescue, not so great. The orbit was never good to begin with and nowhere near enough deltaV. So now we have to rescue Macie too. I'm reliving every mistake I ever made . But I've never been able to speak frankly of such things, let alone make the narrative entertaining. OK, we decided to try to salvage the Minmus base expansion, despite the fact that it was stranded in orbit of Minmus without any probe cores. After some initial failure, an attempt to send dual claw-equipped-probe-cores more or less worked to get control of the various parts. A final attempt was made, we landed a universal adapter node near the base, and had the expansion come, attach to it, then drag it over to the rest of the base and hook everything up. Success! After that it was time for Herely, who was orbiting uselessly while all this was happening, to head home. He made a detour to the highlands to get some science before heading back though. Next I'd like to try out the mining techs, but that requires 1.8M of funds which is going to be a bit of a reach. Hmmm. Haven't had much time to play so this update is a little light. Launched a new Jeb-rescue ship (he's stuck in a Duna-sized solar orbit) after the last one failed. Couldn't get a good orbit though so might wait a few hundred days to see if we can get a better encounter. A Duna window opened, so we sent yet another attempt at getting the Ike-station expansion contract. This was all going too well, so the problem du jour was I couldn't get the two rovers to detatch from the base. I even tried editing the quicksave but that made alarming things happen (such as the entire solar system disappearing) so I guess for now they are stuck to the wall. All things considered that's a relatively minor issue compared to others we've faced. The next update should be more interesting, as I'm going to have to fast forward a bunch so we can try to get some funds. We really need that R&D expansion so we can get drilling tech, but in-system missions without returns are not helping the budget at all. Finally some interesting things happened! and finally, our Jool mission has entered Jool's SOI. They are our last hope to getting enough funds to expand the R&D Center. Glad you finally got the Gilly folks home. And maybe Jeb, too Good luck at Jool! Well, we were having too much success. The Jool mission didn't end as well as it could have. Due to some poor planning our initial Jool orbit was polar and very eccentric. This did generate enough funds to finally upgrade the R&D center though! Meanwhile, Macie (who had been on the first Jeb rescue attempt) ended up at Eve. For some reason it's a lot easier to get Eve encounters than Kerbin ones. It also turned out we had lots of excess fuel (we had forgotten to install fuel lines) so we were able to get into a really ellipitical orbit. We tried to aerobrake to make it more circular, which was a mistake. Brave Macie gathered some amazing science, including tramsitting some last results as her ship was breaking up around her. In the end she's now stranded on Eve, just like Desktop. Finally, after many many years, our very slow Dres probe arrived. We even managed to "land" it in the pitch dark. This completed a very lucrative contract from the early days. We now have a nice buffer of funds and some interesting new science discoveries, so the next update might be pretty exciting. Well we got a contract to expand our Munbase. We decided to combine it with a mining setup. The end result was an 85 ton monstrosity which required a new booster made out of the XL engine parts we had recently developed. Needless to say the first launch did not go well, and our poor pilot, Daphty Kerman, did not survive Revert-to-VAB wasn't happening because an attached rover core survived the explosions. After a period of rest and mourning, plus some time with the rocket equations, Valentina led the return-to-flight efforts and we did get the base to the Mun. It was a harrowing process, not the least because I foolishly removed all of the oxidizer from the final stage. So to get there we had to transfter just the bare minimum oxidizer to the underpowered landing engine, then do a suicide burn with a last-minute stage switch just meters from the surface. All while trying to land vaguely close to the existing base. In the end we sort of did it (we did lose a hitchiker container). So we tried to mine, but got the dreaded "no contact with surface" message despite being flush with the ground. We had to raise the landing gear so the drill was sticking more or less in the air, and then for some reason it happily drilled some ore out of the vacuum of space. And the rover that caused all the troubles? Flat tire, nearest engineer on Kerbin. Oops. Next goal is to try to move the base expansion the 1.6km to the existing base, though that is a job for another day. So we tried to mine, but got the dreaded "no contact with surface" message despite being flush with the ground. The drills have to be mounted high enough not to come into contact with the ground until they not only deploy but also extend a little. If you look closely in the VAB after you deploy the drill, you'll see a faint red line on the texture. That line must be above the surface or the drill won't work. If the line is below the ground, then you get the "no contact" message. Which is misleading because it really should say "too much ground contact". As you see, it really doesn't need any. As long as the ship itself is on the ground, and the drill doesn't hit the ground too soon, then it works even if the entire drill is in the air. Efforts to link the various munbases aren't going well, so we thought we'd try to design a rover capable of moving fuel around, which might help. After Luzor Kerman destroyed some prototypes (and a costly upgrade to the spaceplane hangar) we managed to get a rover that looked like it would work. And we launched it! Engineer Madchell was sent, and maybe she can help fix tires and run the mining equipment. The pilot seat was left empty in memorium of Daphty... but wait! The ghost of Daphty returned somehow! Creepy. Though apparently ghost pilots can still run the SAS so I guess we'll let her stay. We landed on the Mun in one piece (some flat tires but Madchell quickly sorted that out). We're only 10km out from our bases, but there's a major mountain and some large valleys in the way so we are going to have to choose our route carefully. Madchell finished her mountain climbing adventure and it was time to continue on in the rover. Ghost Daphty unwisely took a turn at 20m/s which didn't end well. However when loading the quicksave all four tires exploded and shot the rover in the air. Some quick thinking and we activated the rocket and then flew most of the way to the base under rocket power. At the base we dropped off engineer Madchell to help with drilling, then topped off on fuel to see if we could somehow figure out how to get the base and expansion joined up (they are 1.6km apart). Though in the end that might have worked well. We attached the rover to the original base, and with a little rocket power managed to push it 1.6km across the surface and dock it with the expansion. Contract Complete! I am a bit jealous of everyone who posts their awesome looking bases. Mine always look like junkpiles. "awesome looking bases" are often the result of playing more VAB than KSP, tbh. "junkpiles" have a certain kerbal charm to them that you can never really get if you try. You know just by looking that it was an adventure getting them there -- in this case a good one. A short update this time, with various disasters. It turns out there's a Jool launch window *right now* so we quickly threw a ship together. After the recent incident at the astronaut complex it was decided Luzor was up for a deep space mission. I had wanted to launch two rockets, one with some mining equipment but that was canceled due to budget constraints. AND THEN THE ORE FELL OFF AND SANK TO THE BOTTOM OF THE OCEAN. Not one of our finest moments.